Real Club de Golf Las Brisas is an exclusive private members club situated just down the coast from Marbella. For its design he chose the American, Robert Trent Jones, already considered one of the best golf course designers in the world. He had just finished building the golf course at Sotogrande and after Las Brisas, went on to design Los Naranjos and Valderrama. The course includes numerous water obstacles: there are ten artificial lakes fed by two streams. The greens, the majority of which are raised, are amply protected by bunkers. The results of Robert Trent Jones’s efforts, which we continue to enjoy today, were truly notable and original, obtaining a difficult and attractive course. The quality of the course is evidenced by the fact that it has, thoughout it's relatively short history, played host to some of the most prestigious events including The Spanish Open, Golf World Cup, Nations Cup, H.M. the Kings Cup, Senior Spanish Open, Spanish Juniors Open and many more. 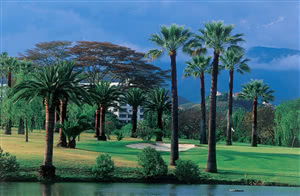 Las Brisas is an exclusive private club and visitor green fees are restricted to only a few every day. Contact club to make arrangements.